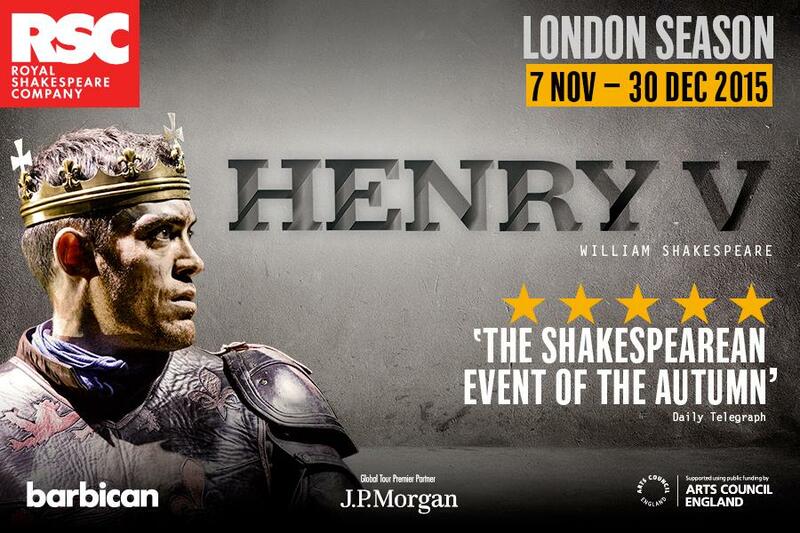 Having staged both parts of Henry IV last year, the RSC kindly brought us Henry V just in time for the 600th anniversary of the Battle of Agincourt with the same company. Last year, I was fretting about this event in my blog posts about Henry IV part one and two because I couldn’t see Alex Hassell as king Henry V. I gladly amit to being positively surprised, even if you can still hear him ticking the (mostly) 10 syllables*, where Shakespeare’s language seems to flow so much more naturally from everyone else on stage. Also, dynamics are important; if you’re too shouty, you lose impact when you need it. Case in point: ‘I was not angry since I came to France/Until this instant.’ Why all the shouting before then? Hassel’s control when Jennifer Kirby, who was a wonderful Katherine, started to corpse was however commendable. I don’t think there would have been much chance of them getting through the scene had he lost it. It was a lot of fun to watch them struggle and the audience in the cinema was giggling along. It is always fun to see Shakespare in a room full of people just for the reactions. Fluellen, Macmorris and Jamy had everyone in stitches, as did Antony Byrne’s Pistol; there was audible discontent when the Constable of France (Sam Marks) was read as one of the dead, and sadly this also marked the first time I had to witness chuckling during ‘Once more unto the breach’. All in all it was a very entertaining, thoughtfully directed and mostly well-acted production. *most lines in iambic pentameter have 10 syllables. If there are more or less in one line, it’s a hint for the actor to speed up, pause or breathe. This entry was posted in Live Cinema Broadcast, Reviews, Stratford (UK) and tagged Alex Hassell, Andrew Westfield, Antony Byrne, Chris Middleton, Dale Mathurin, Daniel Abbott, Evelyn Miller, Gregory Doran, Henry V, Jane Lapotaire, Jennifer Kirby, Jim Hooper, Joshua Richards, Keith Osborn, Leigh Quinn, Live Broadcast, Martin Bassindale, Martin Slavin, Mike Ashcroft, Nicholas Gerard-Martin, Obioma Ugoala, Oliver Ford-Davies, Paul Englishby, Robert Gilbert, RSC, Sam Marks, Sarah Parks, Sean Chapman, Simon Thorp, Simon Yadoo, Stephen Brimson Lewis, Stratford, Terry King, Theatre, Tim Mitchell, William Shakespeare. Bookmark the permalink.